July's cosplayer feature is someone who has impressed me in how much he has improved over one year. From craft foam scales to cold cast shells on his Zora Armor, Jindrax has been a force to be reckoned with when it comes to prop and detail work. Jindrax started cosplaying around March of 2012. 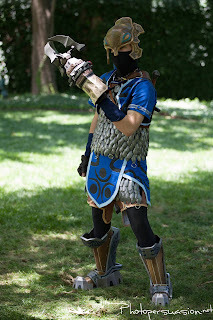 It has only been a little over a year and Jindrax has made Zora Armor Link from The Legend of Zelda: Twilight Princess twice, improving his technique as he went. His secret? Papercraft! The Pepakura program can take 3D models straight form the video game and print them on paper to be folded, reinforced, and painted. Jindrax has mastered this program to create items like the Clawshot, the Zora Helm, and more. Check out these links for Jindrax's work. Jindrax shows that no matter how you start, if you want to make something you can do it as long as you apply yourself. His hard work and creativity shows in each detail and prop. Next week we will be looking at how Jindrax made his Claw Shot so keep an eye out for the next post! Without further ado, meet Jindrax. Why did you choose cosplay as a hobby? I kind of jumped into cosplay as a way of getting over being shy. I was lucky enough to a Pax Prime '12 badge when they went on sale and thought that dressing up as my favorite character would be a good way to try start-up conversations and make new friends. I didn't really know what to build until I stumbled across a picture of Zoroko's Zora Armor Link cosplay. I did not initially consider building the zora armor because of how complex it seemed. I decided the Zora Armor was my favorite version of Link, so I decided to give it my best shot! Jindrax stems from playing World of Warcraft a long time ago. I needed a name for a rogue and started meshing things together until I ended up naming the character Jindrax. After hearing the name for so long while sitting on a Ventrilo channel I kind of just stuck with if for a user name online. I did not realize when I picked it up that I accidentally picked the same nickname as one of the antagonists in Power Rangers: Wild Force! 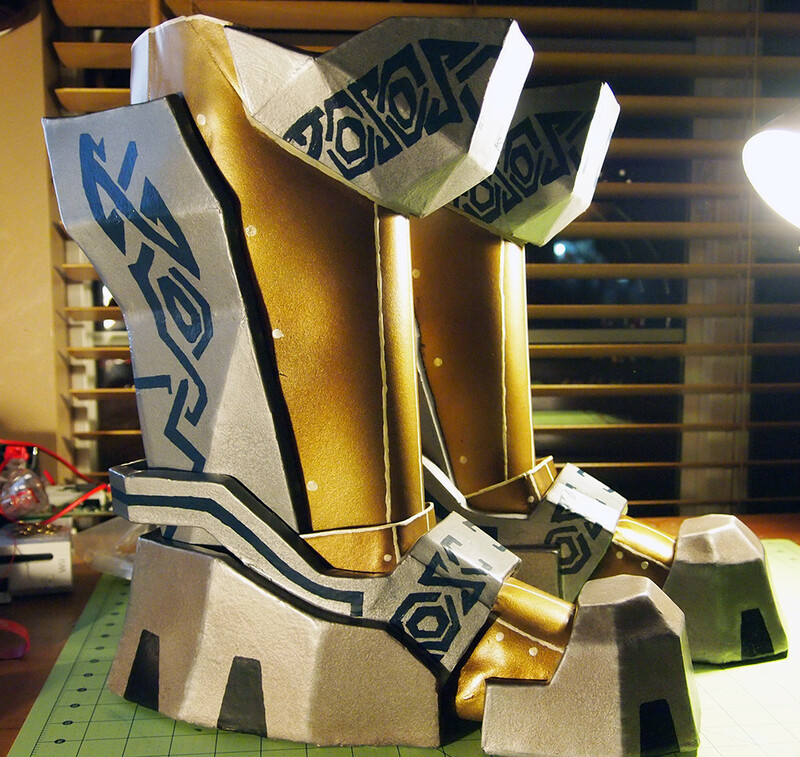 Fun Fact: The boots are made mostly out of EVA foam, which is a kind of floor mat! The thing that stands out the most with your cosplay work is the 3d design and Pepakura prints. The attention to detail and accuracy of the designs really bring the character to life. Why the Pepakura program? into the tunic. That is a lot of hard work! What are three things you do to prepare yourself for creating or designing a prop in Pepakura? 1. Is Pepakura Right For This Build? Some closed oddly shaped objects and small parts can be difficult to reinforce the inside of; will I be able to coat the inside with enough Rondo or other reinforcing agents? How much will this thing weigh if it’s built this way? How much time would it take? How much would it cost? Are there different approaches that might be better? How hard would it be to mask and paint it? Could this be at a high risk of deforming? What material would be the best to use for this model? Pepakura has a scaling feature that will resize a 3D model to fit whatever specification you desire. I usually will scale props relatively based on measurement based on references to body parts (e.g. length of prop relative to character’s distance from elbow to wrist). Even relatively scaled, some objects may be bigger than you originally thought and you may need to downscale to make it more realistic/travel friendly/convention friendly. You’ll have to convert your choice unit of measurement into millimeters for Pepakura. After scaling, some pieces will not fit nicely on a page. Pepakura has a tool called Join/Disjoin Face that will separate/combine pieces in order to make a more organized part layout. Some folds that Pepakura will create will not be optimal or be a nice test of your dexterity stat. With a bit of experience, the Specify Open Edge tool can be used to fix some of these issues. You can see the fine details on helm. I have seen you use different materials when making a prop. What materials are the best to use when making a prop based on a Pepakura model? It really depends on the build. 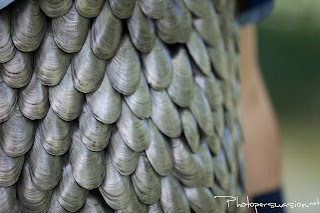 For armor, you can 110lb cardstock and reinforce with fiberglass/polyester resin, urethane plastic, or rondo. Or if you like or have a bunch of foam sitting around, Pepakura puzzle pieces can be used unfolded and without tabs achieve a similar result. Foam can be sealed with glue and painted with acrylic paint or sealed/reinforced with urethane plastic or certain epoxies. For weapons, paper can be used for kind of a traditional approach. If you want to go for a sliced approach, I’ve seen foam and cardboard used nicely for Halo weapons. What is the most difficult step in creating a “paper” prop? Reinforcement. When you put your first layers of resin on a paper prop it will set into the exact position when the resin hardened. It will not move again. With some models, creators will place struts (or paper supports) to keep the paper model steady when reinforcing. You could build a really nice helm and accidentally shift it a bit while reinforcing and it will become deformed to a degree. Your Zora Armor is very impressive. How long did it take you make and what are you favorite and least favorite parts about it? 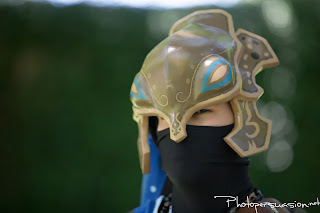 I started in on my Zora Armor project back in March 2012. I initially planned to wear it to PAX Prime 2012. Unfortunately, the glue I used on some of the scales did not adhere to the Velcro very well and the costume partially fell apart while traveling. I did not really have the time to fix it and was frustrated with it so I just went to PAX sans cosplay. After all of revisions and props it took around 400+ hours over a 14 month period to get it to a state that I was happy with. My favorite part of the armor is the iron boots. The build process went really smooth and they are a lot of fun to stomp around in. They were the first project in which I changed my painting techniques around. The overall color of the metal pieces came out great. The runes were difficult but looked nice in the end. Second favorite would probably be the scales. The scales started out as a crazy idea that actually worked. I was not too sure if all of the work would be worth it after the several tests I did. They make the costume a lot more comfortable and improved the overall look of it. My least favorite parts are a lot of the small things that I have had to do to make the costume work. The sleeve things and the helm kind of magically stay in place in the game. I was able to work out a decent mounting system for the helm. Though, I can’t look down very well without risking the helm losing its seating. I wish there was a better way to mount the sleeves and maintain a good range of motion. version for a complicated cosplay. This Jindrax's first test run for the armor. from Version 0 to Version 1. What is your craziest dream cosplay? And do you plan on making it someday? The craziest? From Halo, the MJOLNIR Mk. V, with LEDs, etched visor, and an under suit similar to the one on Master Chief in Forward until Dawn. Can’t make up my mind on which gun to go with it but it would have to have LEDs or possibly a working ammo counter or sound effects. I would love to have it be charcoal grey with maybe a bit of blue accents and weathered. Do you have any advice for new cosplayers? Build whatever you like and most importantly, have fun!